Today was one of those gorgeous Fall days that felt like summer. 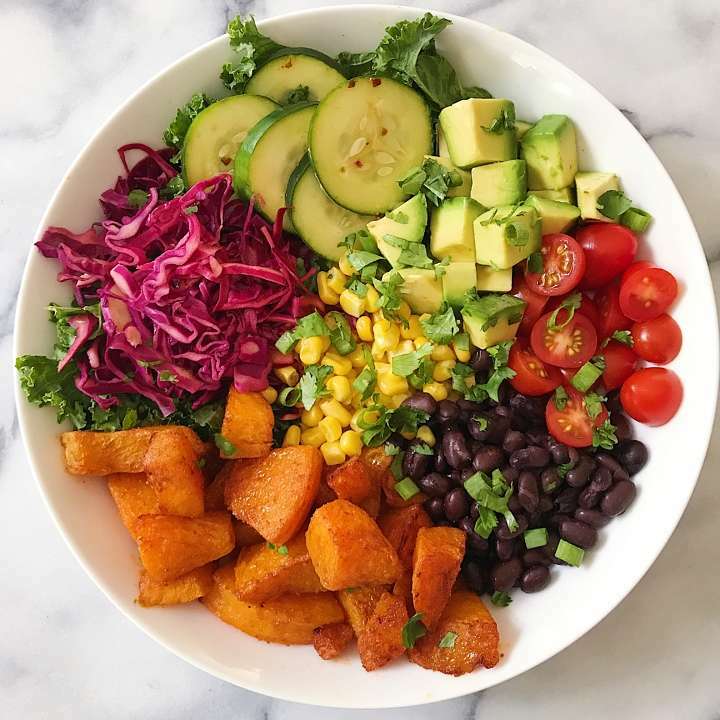 Since it was just me for dinner, I roasted a batch of my favorite Spiced Roasted Butternut Squash and made a Buddha Bowl that felt Fall like but was still fresh and light in keeping with the warm day. Spiced Butternut Squash, 20 minute Pickled Cabbage, 10 minute Pickled Cucumber, Black Beans, Corn, Tomatoes and Avocado. Packed with flavor and so delicious! Super easy and best part, it can be all prepped ahead and heated up/ assembled when ready to eat. A super plant-based dinner big on flavor! Spiced and Roasted Butternut Squash, Quick and Easy pickled cabbage and pickled cucumbers, avocado, black beans, corn and tomatoes. Place Butternut Squash in large bowl. Toss with oil, cumin, paprika, and sea salt. Arrange butternut squash in single layer on baking sheet. Bake 20 minutes. Turn squash over. Bake an additional 15 minutes or until tender. For more crispy squash, bake a bit longer. Set aside. Whisk rice vinegar, sugar, soy sauce,and crushed red pepper in large bowl. Add cucumber slices to vinegar mixture; toss to cover all the cucumbers. Cover and chill ten minutes to 1 hour.